Sample vials with a captive snap closure, flat bottom cylindrical vials with a friction-fit, flip-top closure which can not be lost. These vials are unbreakable and can withstand temperatures up to 90°C. The wall thickness is approx. 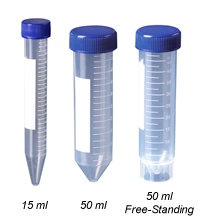 1mm and these vials are ideal for use as a specimen container for the storage of small samples, or as embedding capsules. These vials are optically clear with straight-sides. Made from Type1, N-51A borosilicate glass. Fixation, dehydration, and infiltration procedures can be done in the same vial. 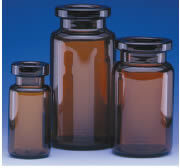 The larger size vials can be used as an embedding media mixture container or for sample storage. The vials come with polyethylene open bottom snap-caps, Titeseal®, which are packed separately. Except the 4-dram size vial which comes without a closure. We recommend the use of our cork stoppers. This vial is made from amber glass and offers protection to light sensitive materials. Vial comes with polyethylene tight-fit lid. 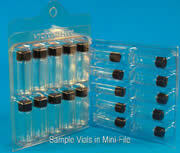 These vials are for use with auto-samplers that require 15 x 45mm vials. The vials are available in either clear or amber glass or in natural polypropylene, without 15mm snap plug cap. 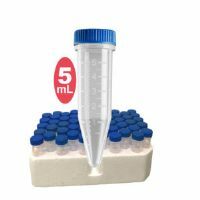 This rugged polypropylene rack holds 48 vials, size 1 dram (15 x 45mm), or 4 ml tissue culture vials, or 2ml serum vials in 4 x 12 configuration with alpha-numeric indexing. The rack is constructed from chemically resistant, autoclavable (121°C for 20 minutes) polypropylene and features corner posts to assure stability when stacking empty. Machined from solid aluminum, holds 5 (#72631-10) shell vials. It is ideal for handling cold or hot samples for prolonged periods of time out of the refrigerator or oven. Comes complete with a handle. Measurements: 4¾" x 1¼" x ¾". Wheaton "180"® low potassium borosilicate glass (meets ASTM Type I Class A and USP Type I standards). Vials are packed in individual cells in trays of 100. Vials are in trays are shrunk-wrapped in plastic, 5 trays to a case. Screw caps size 22-400 is made from Urea with Poly-seal cone liner. Caps are packed separately in polyethylene bags of 100. 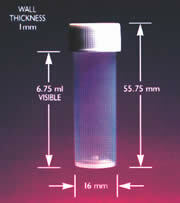 Vial measures 28mm diameter x 57mm height (with cap off), and 61mm height (with cap on). Size 20 ml. Opaque, high-density polyethylene vials are economically priced. They are 20 ml in capacity and they measure 27mm diameter x 61mm height (with cap). 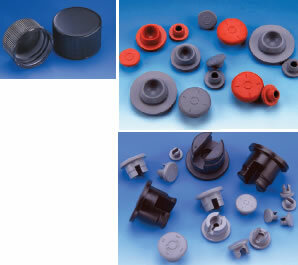 The screw caps are 22-400 and they are made from polypropylene with a foam-polyethylene liner. The vials and caps are packaged the same way as glass vials. For optimal performance in the laboratory, PET plastic vials provide a combination of features previously unavailable in a counting vial. Safe disposal is accomplished by incineration. No harmful gas is generated (only CO2 and H2O are created). These vials are lightweight, virtually unbreakable and they have the clarity of glass. 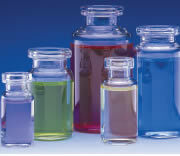 PET vials also offer low permeability to solvents and minimal background count. These vials hold 20 mls of fluid and they measure 27mm diameter, 61mm height (with cap on). 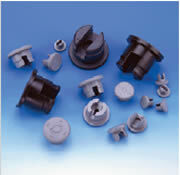 The screw caps are 22-400 and are made from polypropylene with a foamed polyethylene liner. The vials and the caps are packaged separately. The rack measures: 12¾" x 6¾" x 1⅜" High (32 x 17 x 3.5cm), and it has 50 cavities, 1.1" (28mm) diameter x .75" (20mm) deep. The cavities have a center drain hole ½" (13mm) in diameter. The racks are stackable when not in use and are steam autoclavable at 250°F (121°C). Rugged and stackable. They hold 24 scintillation vials (30mm diameter). There is a handle on both ends for carrying. Autoclavable. Tissue specimens have particular requirements for cryogenic storage. The CryoELITE Tissue Vial offers researchers who work with tissue samples ease of use, convenience and security. They are manufactured from low binding, cryogenic-grade virgin polypropylene that meets the USP Class VI classification and certified to be free of pyrogens, RNase / DNase and endotoxins, with a storage temperature range of -196°C to +121°C. The externally threaded cap provides a seal that exceeds DOT and IATA classifications for diagnostic specimens and are capable of maintaining a secure closure during freeze/thaw procedures during transport. They have a flat bottom and a stippled external surface to promote easier handling. Sterile. Peti-Vials are made from a special grade of polypropylene, which produces a product of optimum clarity. Its unique design offers users a leak-proof fit with only one-half of a turn of the cap. Multi-vials are excellent multipurpose containers. They are primarily used for liquid scintillation counting, beta-gamma counting, and sample storage. They are made from a new type of polypropylene, which assures superior visibility. They come with white polyethylene caps and are perfect and convenient for easy marking. 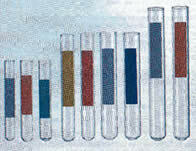 These vials are made from Type 1, Class B borosilicate glass. Their tooled necks ensure accurate fit with "snap-in" closures. 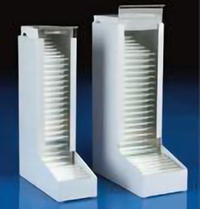 They are ideal for storage of specimens and sample blocks. The 1 and 2 dram sizes come with an open-bottom closure and all of the other sizes come with a closed bottom, two-piece closure. These vials are made from Wheaton-33 low extractable borosilicate glass and they safeguard against any change of product pH caused by alkali, which can be extracted from ordinary glass. 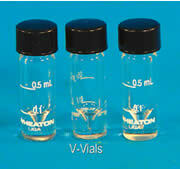 Wheaton V-Vials are exceptionally sturdy vials with a conical interior bottom. Their special features insure maximum security and economy in handling, storing and shipping of costly micro and semi-micro samples. 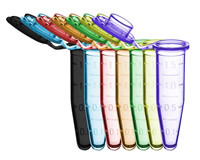 V-Vials are ideal for: Micro Mixing, Homogenization, Centrifugation, Concentration, Extraction, Derivatization, Radiosynthesis, Hybridization, Anaerobic Reactions, and Catalytic Hydrogenation. All components can be autoclaved. They come packed 12 vials in a hinged lid storage box. Graduated, clear, screw cap has solid top and TFE-faced white (styrene butadiene) rubber liner. 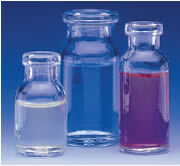 Heat Transfer – a Wheaton Glass serum vial, as opposed to glass serum bottles, plastic serum bottles, and other containers has a very consistent thin wall and bottom. This attribute of a Wheaton glass serum vials allow the heating phase of the lyophilization process to take place rapidly and effectively. Sealability – Wheaton glass serum vials feature a "blowback" feature in neck and bottom. This allows for a 2 or 3 legged lyophilization stopper to be securely and evenly seated in the mouth of the vial during the lyophilization process. An uneven stopper may results in water vapor entering back into the vial once stored. Additionally, these serum vials come in standard crimp finish sizes, for compatibility with various standard aluminum seals and crimping tools. 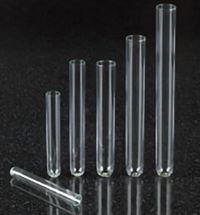 Water vapor Transmission Barrier – Wheaton glass serum vials are made from premium, low extractable, borosilicate glass, which offers a superiorbarrier to water vapors. The vials are available in either clear and amber for UV light transmission applications. 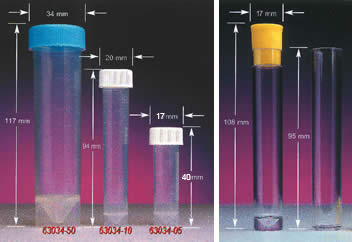 Autoclavable – These vials can be autoclaved, by dry heat, by chemical, by gas, or by radiation. Manufactured from Wheaton "200" low extractable borosilicate glass tubing to hold uniform wall thickness. Glass meets ASTM Type I, Class A and USP Type I standards. Heavy wall construction, designed for lyophilization and freeze-drying. Manufactured from Wheaton 33® low extractable borosilicate glass (meets ASTM Type I Class and USP Type I Standards). The center disc tears out, exposing the top of the stopper to the syringe. Natural in color. Easy-to-use. Push upward on plastic button to access stopper or septum. No sharp metal edges. Removal of the Flip Cap Button can be accomplished with one hand, freeing the other for the syringe. Seal can be completely removed and contents poured from the bottle. These seals are ideal for filling or retrieving contents with a syringe and as closures for many instrumentation applications. These seals have a center disc tear-out, seal lined with "PTFE" – Faced natural red rubber. Manufactured from the highest quality raw materials. An adjustable stopper allows the user to determine the tightness of the seal while ensuring consistent crimping. The jaws are tapered to allow for the crimping of the vials in the racks. Ergonomic, PVC grip and spring assembly reduces hand fatigue. Made from stainless steel offers one tool for both sizes: 13mm and 20mm serum vial de-crimpier. An inexpensive and easy way to remove the seal from the serum vial, simply secure the seal between the jaws, squeeze the handle and twist the seal. Plastic coated handle offers comfort and ease of use. This filing system offers a clean, compact, and convenient alternative for the storage of biological samples. A clear polystyrene case, with hinged lid, alpha-numerical index, and individual partitions. Foam inserts are provided as well and they offer extra protection for the vials. M-T/40: stores up to 40 vials of 16mm diameter x 50mm height. M-T/60: stores up to 60 vials of 13mm diameter x 50mm height. Dimensions: 6¾"(L) x 3¾"(W) x 2½"(H) (190 x 95 x 62mm). Multi purpose glass sample vials. Specifically suited for research studies. 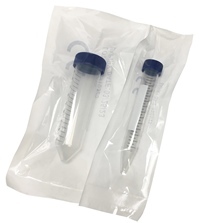 These sample vials are economically priced and conveniently packaged in two shrink-wrapped packs of 100 vials. These vials come with lined caps and are packaged separately. The vials can be sterilized and stored at low temperatures. 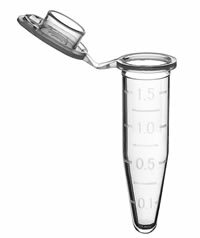 Clear – Manufactured from Wheaton-33R a low extractable borosilicate glass which protects against changes in the pH and maintains sample integrity. Amber – Manufactured from Wheaton "320" borosilicate glass and protects light-sensitive samples. Heavy-duty vial caddy protects up to 48 of the popular 23mm diameter glass vials. Machined from a solid block of 1.25" HDPE sheet offering complete protection during storage and transport. The caddy is supplied with a snug fitting cover and non-skid feet. It is white in color. Comes ten vials packed in a clean plastic thermoformed Mini-File and offers convenience in transporting, displaying and storing. The vials are made from Wheaton-33R a low extractable borosilicate glass. The vials are supplied with a white (styrene-butadiene) rubber lined cap and both the vials and the caps can be autoclaved. EMS introduces a full line of Borosilicate Glass Culture Tubes. These tubes reduce changes in pH and potential contaminants from tubes that are made from soda lime glass. They have round bottoms and feature fire-polished smooth rims. Chemically inert, suitable for use in blood banks and tissue culture. Made in an ISO 9001:2008 certified factory, they are packaged well in heavy duty boxes and shrink-wrapped to stay particle free. The boxes will fit neatly into most test tube dispensers. The tubes are available in 8 sizes. These unique metal dispensers for holding and dispensing glass tubes is able to accomodate dispensing 10 x 75mm, 12 x 75mm as well as 13 x 100mm tubes. The dispenser is painted white and has a front cover made from plexiglass. 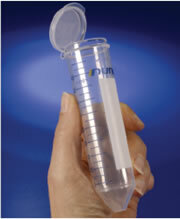 Transport Vials are ideal for sample collection and storage. Made from virgin polypropylene, they are available in three sizes and sterile as well as non-sterile. Graduations provide convenient and accurate references. 5 ml and 10 ml sizes are supplied with white screw cap, 50 ml are supplied with blue cap, that has a molded-in sealing ring for a leak-proof fit. The SmoothRack is versatile and it accommodates a wide range of tubes: 10 to 16 mm diameter. E-Z Microtubes are suitable for a wide range of applications, including storage of cryogenic samples. They have permanent 2D Data Matrix barcodes that are 100% readable. The 2D Data Matrix barcode is white on black and is fully ECC2000 adherent standard. Made of high quality polypropylene and available with a standard internal thread screw cap, the vials are able to withstand storage to -196°C. Leak-proof – Hinged, flip-cap design. Good chemical resistance – low protein binding. 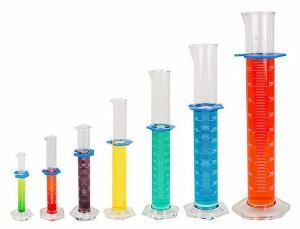 15 ml and 50 ml – Sterile. Clarified polypropylene – good visibility of contents. Compatible with all major centrifuges and rotors. 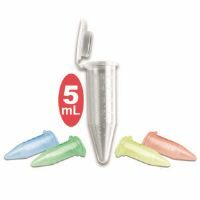 EzFlip™ Conical Centrifuge tubes offers a safer alternative to screw cap tubes. A patented closure system improves ergonomics and versatility. An improved tube and cap design increases mechanical strength to withstand aggressive centrifugal forces. The 15 ml tube's maximum relative centrifugal force (RCF) is 8,500 x g, and the 50 ml tube's maximum RCF is 9,500 x g.
Tubes are graduated and feature a writing area. All EZFlip™ tubes are available in rack or bag of 50, case of 500.